If you have a Microsoft Excel file that is corrupt and needs to be recovered or repaired, Stellar Phoenix Excel Recovery can help you with this. The total disk space required for Stellar Phoenix Data Recovery is around 10MB. The total installation time took less than 15 seconds to perform. Once Stellar Phoenix Excel Recover is installed and executed, the user is warned about excel sheets containing engineering formulas, and that some add-ins will need to be manually added. Most users probably won’t need to worry about this, but in case they do, they’ll know where to find the add-ins. The interface and searching procedure basically follows the same routine as Stellar Phoenix Access Recovery, except the interface is green, and it handles excel files instead. Naturally, I’ve opted to have this application search for the excel files instead. 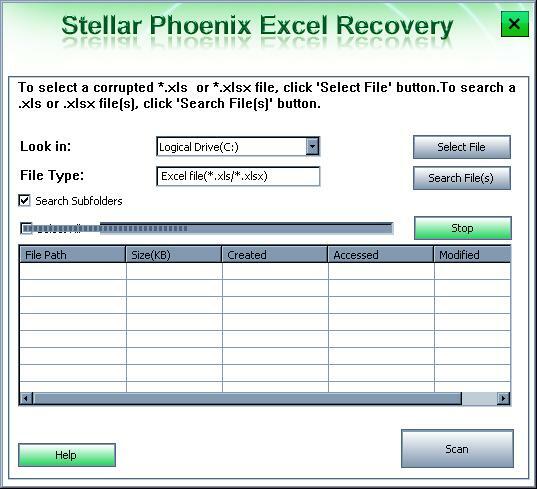 After the file search is selected, Stellar Phoenix Excel Recovery begins searching the appropriate drive for excel files. The only real oddity was the display of the progress bar. While aesthetically displeasing, it still indicates how much of the search has taken place. 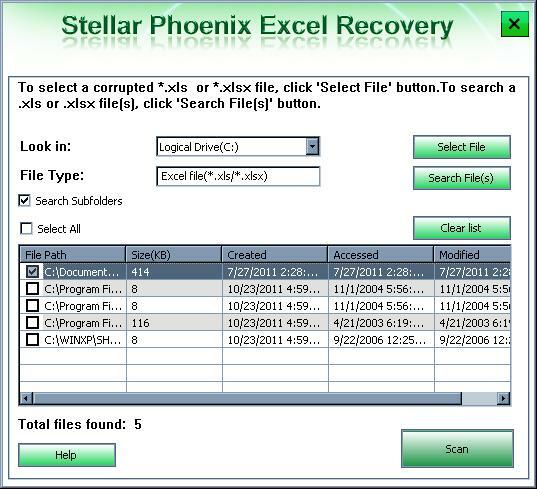 Once the search routine is complete, a list is displayed containing the files that Stellar Phoenix Excel Recovery detected. Below, I’ve selected the first, and largest file to scan and/or repair. The reason for such is that the size of the selected file will give a more accurate time frame for error checking. Once the file is selected, and the “Scan” button is clicked, an event log at the bottom of the main screen shows what’s happening during the scan. The actual scan itself took approximately 15 seconds to complete. After the scan is complete, the information contained within the scanned excel document is displayed, and can be checked for accuracy. Also, from this point onward, the excel file in question can easily and safely be recovered. Just like Stellar Phoenix Access Recovery, the interface is fairly unobtrusive and easy to use. The only real difference between Excel Recovery and Access Recovery is the basic interface color scheme and the type of file being repaired. 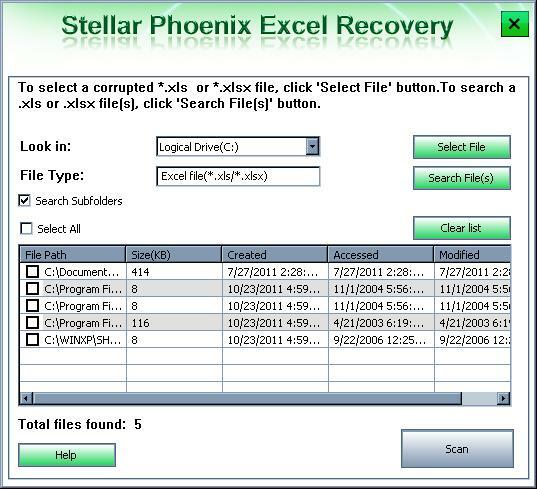 Stellar Phoenix Excel recovery is quick and efficient at recovering and repairing excel files. The interface is simple and easy to use, and the price for this application is quite than reasonable.